When Amazon announced the Kindle 2, they showed off a new synchronization feature that would sync your position in all of your books between Kindle devices. At the time, “Kindle devices” meant the first and second generation Kindles. The intent was clear though, and Amazon soon elaborated that they were going to be bringing Kindle content to mobile devices. What an exciting idea, but I never expected it to happen so quickly. 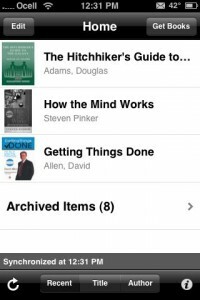 For the past few weeks I’ve been working my way through the book How the Mind Works (Amazon Link) on my Kindle in my spare time. I’m not going to try to give a full review here since I’m only about half way through the book, but I did want to write a quick post here recommending it. The author, Steven Pinker, does an amazing job of taking extremely complex concepts and distilling them down into language and metaphors that anyone can understand. Among many other points, Pinker touches on how the mind works mechanically, why it may have evolved into the form it is in today, and the differences between cognition and sentience. The book covers much more ground than I can summarize here, so check out some of the Amazon reviews for more information. Pinker has written a few other books since How the Mind Works, and I’m trying to work my way up chronologically. I started to read the begining of his book The Stuff of Thought: Language as a Window into Human Nature , which covers how our mind developed and uses language internally and externally. It was very interesting and I’m looking forward to getting to read the whole book.